Rating: 7+ Keep in mind that the book does deal with illness, and there are ghosts in the book, but they are not scary. This past June, as part of Pop Culture Classroom, I was part of an amazing group of people that worked with the French Comics Association and the Children’s Book Council on a day of graphic novel/comics programming at ALA (the American Library Association conference). ALA Friday consisted of approx. five panels that were well attended, well received, and staffed by some of the most amazing artists and authors I have worked with in my time doing this work. We even had some surprise guests show up to the room that day, and one of them happen to be multiple Eisner Award-winning, New York Times Bestselling author Raina Telgemeier. It was an honor to meet her, and it made the day even better! Fast forward to now. The Comics Education Outreach, a program of Pop Culture Classroom, is in the process of working on something big: we are developing lending libraries of classroom sets of graphic novels (with lesson planning materials) to lend out to schools in need. The titles which with we are starting, and application information for the libraries can be found here. One of the sets that we will be lending out is going to be a lit circle consisting of three of Raina’s books: Smile; Sisters; and Ghosts. Ronell Whitaker (@MisterWhitaker) and I are currently working on the lesson planning materials for the books, so it only makes sense to make one of this week’s review books a book that I am working on for the lending library: Ghosts. 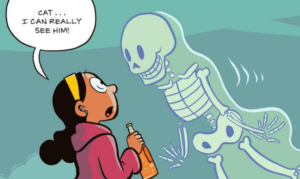 Ghosts is my favorite Telgemeier title. 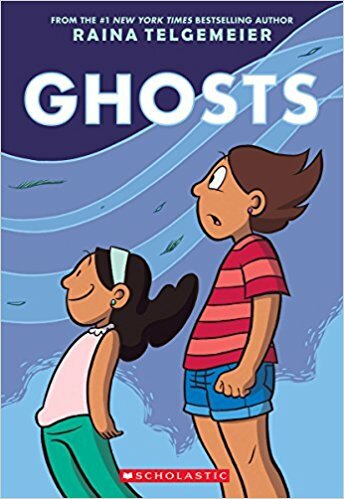 About a family that relocates to a different town with a different climate in hopes of alleviating some of young Maya’s Cystic Fibrosis symptoms, Ghosts is one of many Telgemeier books that packs an emotional punch wrapped in a familiar human package containing recognizable familial relationships, common social problems, and the pains that arise from growing up and being a kid. The writing and the art are excellent and approachable for almost any reader, but what I dig the most about the construction of this book is its pacing. Pacing is a problem when it comes to many comics. It’s hard to pace comics well. Most of the time, authors/artists develop scenes/sequences too quickly, causing a book or story to feel rushed or incomplete. 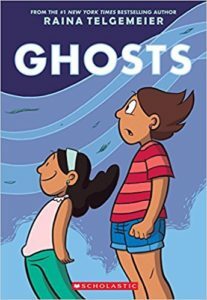 I can say that I never have that problem with a Raina book, and Ghosts is a great example of quality pacing. While it is a young adult graphic novel, I believe that all novice comic/graphic novel writers (and writers in general) can learn a lesson about pacing from this book. The characters are approachable and possibly not as predictable as you might assume from a young adult graphic novel. The setting of this book is unique. But the most interesting aspect of the story is that it takes you to a few places that you might not see coming, and while a couple of the story elements might be predictable to a more experienced audience, it has its share of surprises to even the seasoned of readers, and the predictability might be a good opportunity to teach younger or non-advanced readers about foreshadowing and setting expectations as a reader. I initially said that these reviews would be around 200 words each since I’m doing 365 of them, but hey, I’m on summer break, and I loved this book; get over it. Hoping you and your readers are interested in critical reviews of GHOSTS. There are several, including mine.